So I've just recently learned about Seabuckthorn. I really had no idea what it what until I found Sibu Beauty. High in the Tibetan Himalayas (12,000 feet above sea level) grows a tiny but resilient fruit that resists the harsh weather conditions and high altitudes. The sea buckthorn berry fortifies itself against the elements by producing an array of powerful nutrients. With over 190 bioactive compounds, sea buckthorn is an unsurpassed source of Omegas 3, 6, and 9. And it's a rich source of the elusive essential fatty acid, Omega-7, an essential fatty acid vital to collagen production and healthy skin, hair and nails. 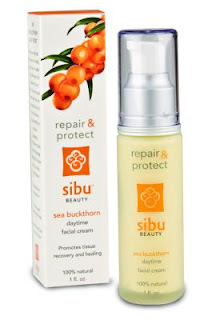 Sibu Beauty’s sea buckthorn berry-based facial cream Repair and Protect is packed with the fatty acid Omega-7 and helps to boost collagen production and creates the prefect barrier to moisturize, rejuvenate, repair and protect your skin for more radiant, softer and healthy looking and feeling skin. 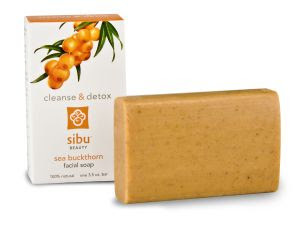 The Sea Buckthorn Facial Soap Lathers thick and rinses with ease to cleanse, detox and moisturize, and repair the skin while creating a protective barrier against UV rays and cell damaging free radicals. I was iffy about using a bar of soap on my face, but I was actually surprised. Once again, it has the soft orange smell, and it lathered and cleansed my face perfectly. And for $5.95, this is a steal. The Sea Buckthorn Liquid Supplement was my favorite. 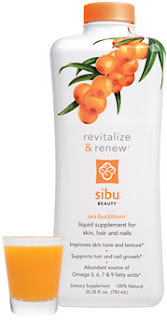 Revitalize and Renew is an all natural liquid dietary supplement made from the nutrient-dense sea buckthorn berry harvested exclusively for Sibu Beauty in the Himalayas of Tibet. This invigorating blend is a mixture of tart and sweet, and a delicious way to begin and end each day. Each sip embodies the spirit and resiliency of the hearty, orange sea buckthorn berry. Revitalize & Renew is loaded with the essential Omega fatty acids 3, 6 and 9. It is also a rich source of elusive Omega 7 fatty acids, a rare and vital component for cellular support and healthy hair, skin and nails. This proprietary formulation is also rich in phytosterols, polyphenols, amino acids, carotenoids, flavonoids, vitamins and minerals. Sea buckthorn berries contain over 190 bioactive compounds. 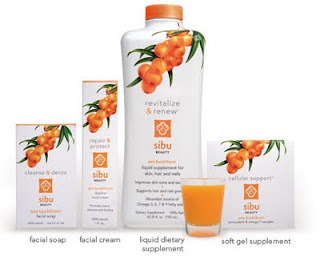 more at the Sibu Beauty website. The Age defying eye cream!